For many of us, the last two weeks of summer are full of anticipation, leisure, last minute plans and occasionally dread as we soak up the final moments of freedom. For Wenatchee High School’s Golden Apple Band, however, those weeks consist of something else entirely. The G.A. band uses the last stretch of summer to introduce new routines and drills during a two-week period known as band camp. Each day typically starts off with the band practicing marching drills and learning their field show outside and then continues into the afternoon with the band divided into sections by instrument and rehearsing the music. This camp is notorious for being an incredibly intense initiation to the year, with band director Jim Kovach at the helm. 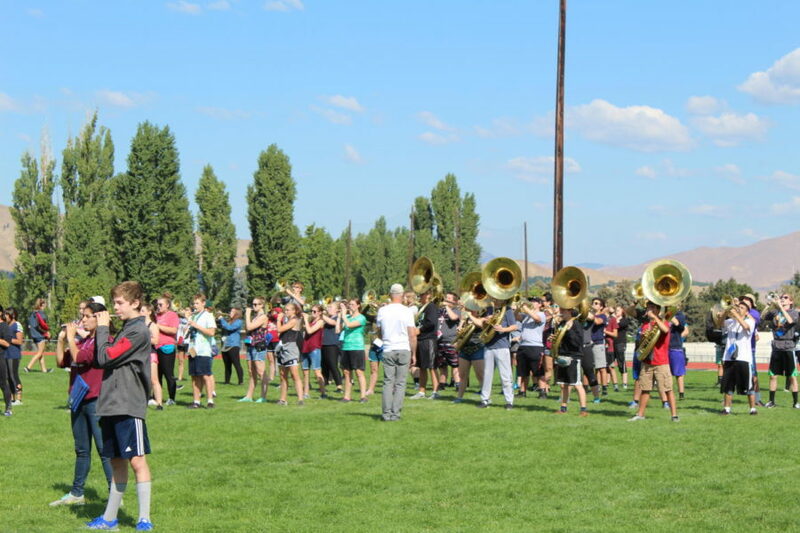 Kovach is beginning his 19th year as the band director, and said that he and his staff spend about 88 hours with the band during the two-week camp. For Drum major junior Johan Luna, this year’s band camp was his first experience directing the band instead of being in it, and he enjoyed it. “Being a leader is really fun and I like helping others, like the freshmen,” he said. The discipline instilled by leaders like Luna during band camp plays a major role in the overall confidence and unity of the band throughout the year. According to Kovach, there is a noticeable difference in sound, not to mention marching, choreography and visuals. Because of this dedication, the G.A. band has found great success at competition in the past years – including sweeping the caption awards at the 2017 Auburn Veterans Day Marching Band Competition, their most recent field show competition. The Band kicks off their season at the Cavalcade of Bands in Pasco on Oct. 6.